Working on the ocean has always made for an unpredictable career. Back in the olden days, no long-range weather forecasts or radar systems were available, meaning boats would often set out into storms without realizing it. Wooden ships, as most were in the early days of ocean exploration, could not withstand the turbulent waves and winds and would often succumb to the sea’s deadly power. In the 17th and 18th centuries, ships were often overloaded with cargo and people, which only further inhibited their movement through tempests. Even in modern times, safety can’t always be assured. In 1994, the Silver Seas was returning from Haiti, en route to Florida. The crew of Silver Bars (which would later become Sub Sea Research) planned to take the Windward Channel from Haiti up around the tip of Cuba. This journey would take all night, and would allow them to travel straight from Cuba to the Keys of Florida once out of the passage. Captain Doug Piehl was steering the ship that evening, and had to rely on several outside sources for weather information. The Silver Seas was no equipped with long range forecast equipment like any of the company’s later ships would be, and reports from NOAA were not possible to attain because of how far south they were. In this situation, it would have been advisable to try to contact a nearby freighter or other ship, and if they didn’t answer, then to wait it out. When no answer was given, Doug made the decision to go onward. Everyone was tired and wanted to go home, after being in Haiti for many weeks. Nobody was really at fault here… the seas were calm as they headed out, and the sky was clear. It seemed like the perfect night to travel. A couple of hours into the journey, a storm descended upon them of epic proportions. The winds were at 50-60 knots and the seas built up to 20 feet, raining down in one giant wave after another. The small Silver Seas would climb up a wave, hanging almost vertically over the top with its propellors spinning out into the air, and then crash down into the valley between waves, before heading up another humongous crest. Water was splashing across the bow with every downward motion. The entire crew was intensely seasick, with the exception of Captain Doug, Artie, and Greg Brooks (my father). My dad was downstairs in his cabin and came up at midnight when he heard the sound of chains scraping. Everything was pitch black, and no one was on the bridge steering the ship. He looked out at the bow and saw Doug and Artie crawling on their hands and knees to the edge of the bow. The anchor had come loose when the pin holding it had broken, and the anchor was falling down into the sea, its chain sliding against the bottom of the ship. It was paramount that they keep going at this point. The chain could easily wrap around the ship and flip it over in seas like this. My dad started to steer the ship and put the spotlight on the bow for Artie and Doug. They managed to pull the anchor and chain back and re-pin it into place with a new pin. It is safe to say that they likely would not have made it, if they had been unable to do this. Everyone thought this was the end. No one had ever been in such a rough storm, and my dad still counts this experience as the most terrifying he has ever lived through at sea (and he has lived through some pretty crazy and amazing things). He wrote my mom a letter, which he placed in a bottle, just in case the ship perished. Somehow, they made it. 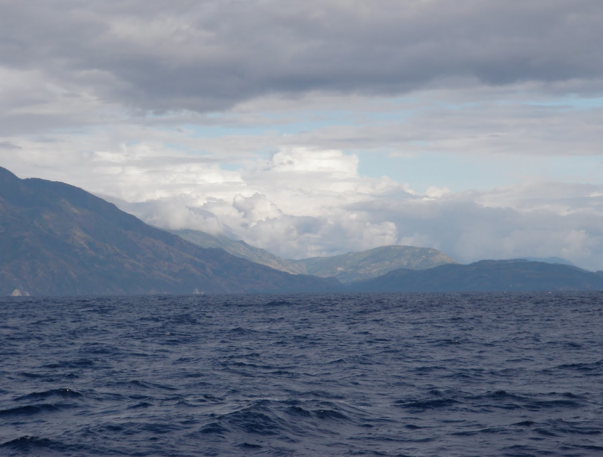 The crew steered the ship out of the Windward Passage at daybreak, rounding the tip of Cuba into calm waters. Just as they entered the flat, glassy seas, the ship’s generators died, along with both engines. The ship was shaken up so badly from the storm that all the debris, dirt and algae plugged up the filters and no engines and generators were able to get fuel. If this had happened in the middle of the storm, the ship would have sunk and they would not have made it. Now that they were under sunny skies once more, they were able to change the filters without much trouble. I think this story is truly representative of my dad and his crew’s spirit. They have gone through many truly horrifying things, and have pulled through by working together and uniting to get the job done. It is with a deep admiration that I say this spirit is what will guide them in whatever ventures they embark on. While they now have equipment that would ensure this type of thing would never happen, it is something that they learned from and never forgot. I know that all of these experiences give them even more of a skill set to draw from, and eventually lead them to all the treasures they seek. Wow, nicely written Ashley. Thank God they all made it through this horiffic storm.